LeoVegas NZ Review - Exclusive 22 No Deposit Free Spins Bonus April 2019! LeoVegas is an online casino that tries to replicate the glamour and glitz of Las Vegas to the comfort of your couch. This is a tailor-made a mobile casino that was established back in 2012. A multiple award-winning casino, LeoVegas prides itself on offering some of the best in terms of bonuses, games, and promotion campaigns. Elements like the intuitive user experience are a bonus for the users. Leovegas offers 22 free spins on Aloha, Dazzle Me, Starburst, Jack and the Beanstalk or Hansel and Gretel when you create a new account. Open one of the following video slots to claim your free spins: Aloha, Dazzle Me, Starburst, Jack and the Beanstalk or Hansel and Gretel. Leovegas offers up to a toal of $1000 in casino bonuses + 200 free spins on your 4 first deposits. *All free spins are credited to Aloha, Dazzle Me, Starburst, Jack and the Beanstalk or Hansel and Gretel. Your casino bonus will be credited instantly. In order to receive your free spins you have to wager at least $5 on any casino game. Free Spins and Casino Bonus has to be wagered 40 times the bonus amount. There’s no max win on the 22 free spins. There’s no max bet when playing with a casino bonus. LeoVegas casino manages to present an attractive interface that tries to replicate the world of Las Vegas casinos as much as possible. They are one of the top NZ casinos, Crucially, there is a self-awareness in the industry about the importance of multiple gaming opportunities being a crucial factor in the success of an institution. These two factors are being presented in equal measure, but there is more to LeoVegas than just games and bonuses. This is a casino that will instantly appeal to players with varied tastes and interests. It is down to the sheer variety of game titles available. Just in terms of the slot games, there are close to 1000 different titles. Since these titles come from a varied list of providers, it is possible to come across a slot title to suit everyone’s tastes. LeoVegas also has an excellent collection of titles in the jackpots, instant win, live casino, and table game categories. The sheer variety of titles makes LeoVegas an ideal choice for those who want to try out a new game, but simply lacked the means for the same. A dedicated section is available for the live casino games, which are available huge numbers. There are more than 100 titles in this section, thus ranking as one of the biggest in terms of options. Live Roulette has the most presence in this category with more than 40 titles. There are male and female dealers in equal measure. They are attractive, friendly, and professional in their approach. It makes for a compelling gaming experience, while the standards of the graphics are of the highest order. The loyalty program at this casino is handled in the name of a VIP experience program, which has been designed to reward the high rollers. Regular players at the casino will be able to access different levels of the VIP program so as to get different forms of rewards. Specifically with regard to players from New Zealand, the advantages of this loyalty program are not limited to invitations to VIP events and dedicated account managers. There are also birthday rewards and monthly prize draws too. 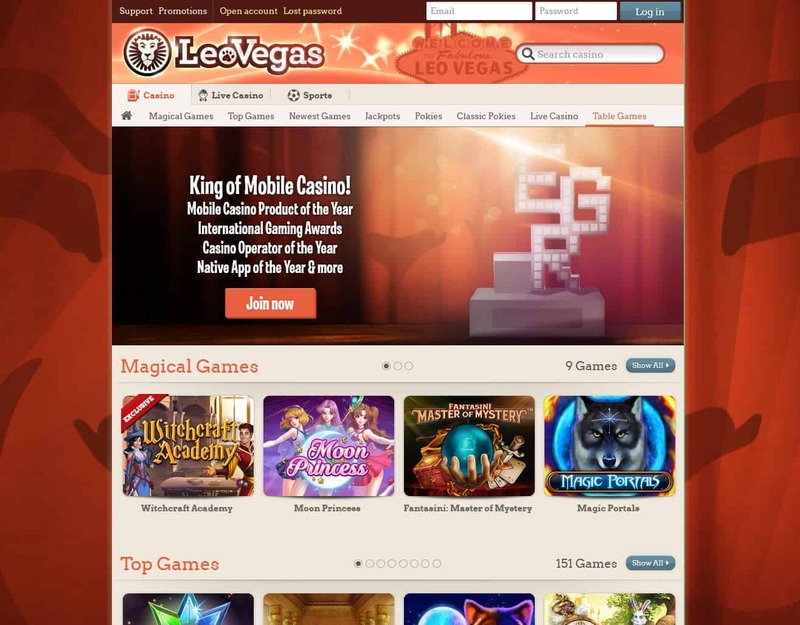 The LeoVegas casino is primarily meant for the mobile platforms. However, it has also been catering towards desktop players in recent times. As a result of being built with HTML5 technology, LeoVegas has been able to make sizable progress with regard to making an impression. As a result of being a global gambling institution, LeoVegas accepts the need for a wide range of payment options. Apart from the regular stream of card payments, a player can use the likes of Skrill and NETELLER as a way to deposit funds into the account. The similar number of options is available when it comes to withdrawing funds from this account. The withdrawal process is fairly quick with funds taking anywhere between 3 to 5 days in order to appear in the account. There may be a requirement for identity verification in the case of withdrawals made to certain countries, but this is only an issue when it comes to the first withdrawal. Support at LeoVegas is dealt with a comprehensive FAQ section, which has details about most of the common queries that users might face. They may include categories like deposits, withdrawals, account verification, account, game rules, and several complications. In order to address these queries, the FAQ section has a reasonable amount of information. If this does not satisfy the quench, players can always get in touch with the customer service team through a live chat or contact form. The casino even provides direct phone lines for UK, Ireland, and international customers. The response is fairly quick and the issues are solved within 24 hours. Licensed and Regulated by the Malta Gaming Authority and holds the following licences – MGA/CL1/882/2013 and MGA/CL1/883/2013 issued on the 6th December 2013, and MGA/CL1/1035/2014, MGA/CL1/1036/2014, MGA/CL1/1037/2014, MGA/CL1/1038/2014, and MGA/CL1/1116/2015 issued on the 10th December 2015, MGA/CL2/1156/2015 issued on the 14th April 2016, MGA/CL1/1126/2015 issued on the 23rd December 2016, and MGA/CL1/1115/2015 issued on the 18th January 2017.